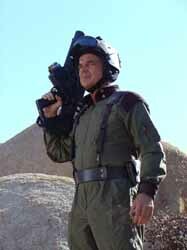 Cyxork 7 stars Ray Wise (Twin Peaks, Robocop) as washed up actor Rex Anderson - whose known to thousands of fans as sci-fi action star Kommander 88 in the long running, and rather poor, Cyxork series of movies. Having fallen on hard times (he's living in a bus with his pregnant wife) Anderson is now banking on the publicity of shooting the latest sequel to the faltering Cyxork sci-fi franchise during a predicted massive earthquake. The Cyxork series has hit hard times. The only people who are still watching are the hard-core fans but will they want to see this new movie? It's doubtful as, for some bizarre reason, the studio heads have decided to employ a new director called Angela LaSalle, whose previous gigs have been a lot more artistic. This will be her first feature film and she wants to make a name for herself. However, the fans don't want art, they want to see Anderson kill someone, or thing, every few minutes. The production is way behind schedule and Anderson wants LaSalle out, but his move misfires - they both get fired and the movie is shut down. 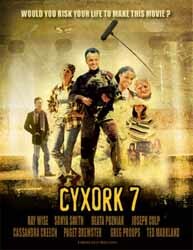 Cyxork 7 is part comedy, part social commentary and part two fingers up to the Hollywood machine. Parallels are bound to be drawn between this and Galaxy Quest - simply because it concerns an ageing sci-fi actor who has done nothing with his career thanks to the fact that he has been stereotyped as a sci-fi action hero. 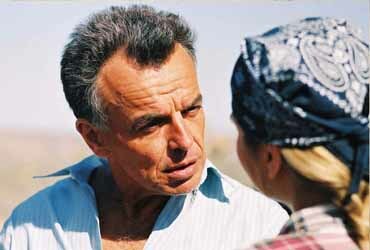 Ray Wise is not known for his comedy roles - having said that, he is in the lucky position of having a varied career in which he has not been typecast in any one role - and it is a credit to his skill as an actor, not to mention a credit to the casting director for having vision enough to foresee his potential, that he jumps in with both feet and makes this character work. In fact, I can't think of anyone else who would have brought this particular role to life with the same spark. It's great to see Wise play a typecast and naive actor, especially when his own career is anything but. You also have to admire the way he can deliver intentionally awful lines with enough conviction that you're actually not sure whether they are bad or not - the most obvious example being: "I loved you before I ever saw you." Full marks to the script writer for coming up with that gem. And as for his on-screen love scene - possibly the most embarrassing movie moment of modern times and a hoot to boost. Sonya Smith plays the naive, artistic director who is way out of her depth working with a star like Anderson. She doesn't know the Cyxork series as well as her star, and while she wants to add a little bit of artistic flair in to the movie, Anderson is more interested in giving his fans what they want - that and making sure he gets to kiss a beautiful damsel in distress. While Wise's Anderson character and Smith's LaSalle are the stars of the show, this movie benefits greatly from the fact that it is an ensemble piece that thrusts all of the characters into the limelight at various points in the production. Cassandra Creech [pictured right] is perfect as the beautiful love interest for Anderson character in the movie. I know we'll be seeing more of her in the future. Beata Pozniak (who Babylon 5 fans may recall guest starred as President Susanna Luchenko in the episode Rising Star) is convincingly scary as Anderson's power crazy and materialistic wife. She plays the role with an animal like coldness - mainly down to the fact that she is pregnant and trying to protect the future of her and Rex's unborn child. 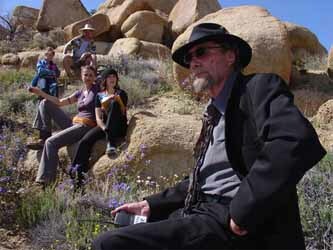 Rex himself is little more than a lost child, constantly told what to do - whether that be at home, by his wife, or in the work environment, by his directors. Greg Proops and Rebecca Corry [pictured left] open up the movie as Rob Berdash and Heather Binge - GNN's (Generic News Network) cool reporters. Their entertainment bulletins are peppered with foul language in a parody of near future hip news reporting. They use shock tactics to grab the viewers attention, but even they are surprised at how far the Cyxork 7 crew are going in order to film their latest movie. Roberto Bacalski is also fantastic as the over the top and rather twisted Clever Bill Emory. He's a little unhinged and thinks nothing of patronising his staff - to the point you just want to smash his face in. It's his money that is financing Cyxork 7 and he cares nothing for the people behind the project, just the money. It's a shame his role wasn't a little larger as he really is a comic genius. In all honesty, there isn't one bad performance here. Some may think that Pozniak's acting is a little over the top, but her character is a little unhinged (hell, she's loopy) and I loved her over exaggerated trademark hair flick. I know, I know, you're asking: "How can you overact a hair flick?" Well she does, somehow, and it looks fantastic. The end result is a extremely satisfying movie with some hilarious laugh out loud moments. If you don't split your sides laughing at the shock fate that befalls one of the crew then you probably don't have a sense of humour. In a time when Hollywood is turning out dull CGI flicks with little or no plot, it's great to see that there are studios out there that will back projects that still have some character and really go for the balls. Funny, refreshingly original and a damn fine script, mean that is certainly at the top of my "must see" list of movies this year. Cyxork 7 is not to be missed.